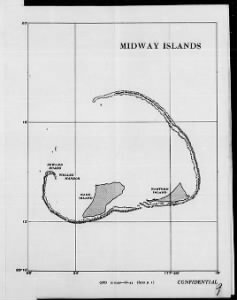 Did you have family who fought at Midway? Tell us about them! Or learn more about the battle on Fold3. Yes, my first cousin Jack Caddel, was stationed on the Yorktown. He was off the ship flying when sunk. The three man crew flew to another ship to land. The Doolittle raid had nothing to do with the battle of Midway. The Japanese started planning the operation early in 1942. Also the invasion of Attu and Kiska was a totally separate operation and not part of the Midway planning. 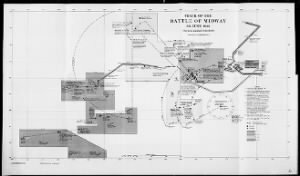 See “The Battle of Midway” by Craig Symonds published in 2011. I am sure there is much debate concerning the correlation of the Doolittle Raid and the Midway battle. In his book, “First Heroes”, Craig Nelson, (2015), the Japanese did want to draw out the American carriers and had planned the attack for some time. However, the Raid forced them to try and “save face” in their homeland for allowing bombs to hit the Japanese homeland. Nelson goes into great detail how several Japanese operations, including Midway, were in retaliation for the Doolittle Raid. My Graddaddy was on the USS Yorktown CV-5 in the Battle of Midway. I am so thankful I got to hear many of his war stories before he passed. We went to his shipmates reunion in Mobile in 2003 I think. Such a great experience meeting all those brave souls. They along with many from the WWII Generation truly put the ERA in America. My cousin, Preston Mobley was on the USS Enterprise at the battle of Midway.’ I also had 2 brothers in the Pacific 1 army Jessie A. Kilgore , wounded in the invasion of the Philippines and again on Okinawa. William E. Kilgore USN served on the USS BULL DE 639 (I believe) In the battle of the Philippine Sea where it fought alongside the USS JOHNSON and other Destroyers against overwhelming Japanese odds. He was severely wounded. I also had 3 brothers in Korea . 2 Army , Kenneth W. Kilgore and John L. Kilgore. James R. Kilgore USN on the USS Hornet CVA 12. My other brother, Marion J. and I served in the Army. My husband Lyle Albaugh served on the USS Hornet CVA-12 during the Korean conflict. We had the opportunity to visit the Hornet in San Diego as a museum. My father, Joseph Trapasoo was a photographer and naval officer who fought in the Philippines (PHOM3). He took a lot of great pictures, some sad and others amazing. I still have the pictures of the memories back then. Tragedy to see how many men lost their lives and what they went through. My uncle was on the Hornet & if you have pics of the men can you share some with me to see if he is in any of them? My grandparents were friends with a military family who had two sons in the Army and two in the Navy. The oldest son was on the destroyer Hammann DD-318, I think, as it was accompanying the severely damaged Yorktown after the Battle of Midway. A Japanese sub torpedoed the Hammann and the Yorktown. The Hammann broke in half and sank in 10 minutes, killing over 80 men, some of whom died when the depth charges went off as they sank. The oldest son lost his life. The younger son was on the Yorktown when this happened and witnessed the disaster and loss of his brother. My Dad, James A. Baker served on the Enterprise and he was proud of his ship from 1940-1945. He saw many battles, but only spoke of one when he with 20 other shipmates were together when a bomb came through the compartment , lights went off, when there was light again.. He discovered that all were killed, he only lost his hearing in one ear. Some miracle. He passed away in 1974.